The Bookshelves: Blogaversary: The Bookshelves is 3 Years Old! + Giveaway! Blogaversary: The Bookshelves is 3 Years Old! + Giveaway! It's finally that time! 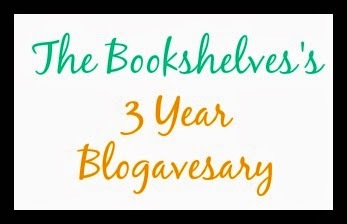 It is The Bookshelves's 3 Year Blogaversary! Yes! I am super excited for the blog to be 3 years old and I had so much fun and memories! The Bookshelves is offically 3 years old. Thanks you so much! I thought I would honestly never get this far and I do remember all those bad thoughts when I first strated to blog. But here I am know and I'll tell you my secret: Keep on writing, blogging, and reading! If you think no one is reading because of no comments, there is a least one reader always reader your blog! Trust me! Happy Blogoversary! I'm heading to 3 years of blogging as well :) Your blog is lovely. Congrats on your 3 years Patrick :) Your blog has always been amazing! My 3 years will be coming up in October. That's crazy!